Rapido LMS/GWR/BR Gunpowder Vans announced! Today at Warley, Rapido have announced LMS/GWR/BR Gunpowder Vans. More details to be released in early 2018!! I assume that these are 4mm? That is a surprise. A steam era wagon from Rapido replacing those aged Dublo derived models. But from the photograph of their stand in their newsletter of last night, they have early EP prints at Warley! That photo wasn't a close up, so perhaps someone else managed to get somenting closer with their mobile phone? In all seriousness though, this is a good move, and a promising sign on more things to come? The image can be seen on Facebook here, for those of you not in receipt of the Rapido newsletter. You may have to play a bit of Where's Wally - as I did - but if you can't be bothered for that sort of thing, then take a look to the bottom left of the right-hand perspex display cabinet.... They look like 3d printed stereo samples to me, and would love some additional images if any RMwebber in attendance would be so kind. China is renowned for producing fireworks, so maybe we,ll actually have a gunpowder wagon full of gun powder! At least your parkside one is to a different diagram, (and is very different) I understand this is for the smaller sized diagram once produced by Hornby Dublo, so will look good together with the parkside one. I have a half finished Dublo model to go with my finished parkside which will now be left in parts, while the transfers ( you get two sets on the Fox sheet) will probably end up on an iron mink conversion. What diagram is it, and what's the earliest building date? D1665, 1929 1923 as far as I can make out. Those were rated at 7 tons, the later 11-tonners (Dia.2093) seem to have been built from 1943. Console youself in the fact that yours will be better, and probably a different digram. Lets not bang on about it and rub saltpetre in our wounds. Yours appears to be the npowder variant. O Lordy! Good job its an EP. Panel spacing looks a bit suspect. Brakes pushrods are reversed and vac cylinders on the wrong side. What diagram is this supposed to be? Looks Like a mix of GWR & BR. Oleos look good though. I think those boys at Rapido are testing our observational skills and 10/10 for announcing this in November. Correct. It's based on a GU drawing. Oh. More boring modern image stuff then . My bank account will be happy . IIRC the panel spacing is one of the features that differentiate the various origins of these vans, so I hope they don't think they can do all of them with one bodyshell. The pushrods are right if the photo is of the Morton clutch side, which I think it might be (all the milky bar stuff is a bit confusing, especially as not all of it is straight) but you are definitely right about the vac cylinder. 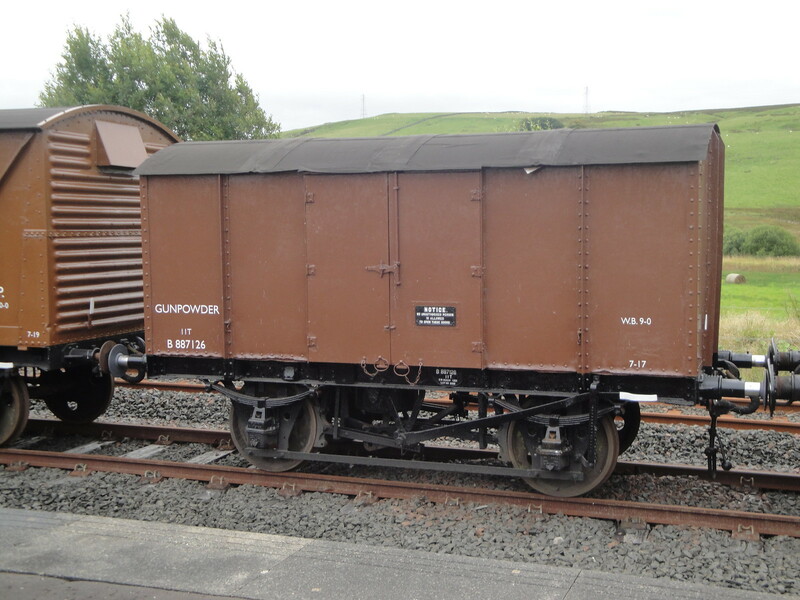 Mind you, a lot of (if not most) gunpowder vans were built unfitted and with independent brakes. The Oleos and the AVB both hint at a wagon built or rebuilt by BR so there is hope. This thing could also replace the Triang exploding car by using gunpowder triggered by DCC control. "Rapido's most realistic exploding RTR van to date. Can be used once but we will ensure continuous supply.. We gaurantee this model is in perfect condition until it explodes." You're right. Now I'm on my big puter I can see the Morton Clutch. Unless it a badly aligned lever. Looking at the W Irons and stanchion to solebar fixing It looks like it could be GWR Diagram Z4 on a N30 underframe with the BR retrofit stuff or one or the example built by the big four. The outer panel looks to be wider than the inner, (Never happened as far as I know) but that may be a trick of the light. The other way round, yes, like the last BR builds as in my pic above. I assume rapido know that some vans in preservation don't reside on their original u/frames. There's so much info beie published on these vans down the years I'd be surprised if they got the final edit wrong. At the moment I think the best way to be is to wait and see what they say in early 2018. If my experience with the production and delivery of Rapido North American prototype freight cars (see Northern Pacific wood box car) is any indication, it will be and extended wait for these to appear. Fortunately I have resisted recent opportunities to buy a kit or s/h HD body. At least they didn't scupper me by announcing some banana vans.